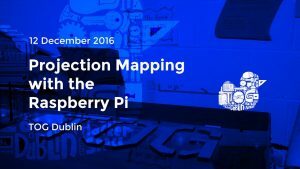 An introductory workshop where one could learn the possibilities and try out projection mapping with the Raspberry Pi. A full stack setup cycle demo will be presented. The following will be covered in a run-through manner. The Raspberry Pi mini-computer is the perfect choice when one has to create a permanent projection mapping installation. OpenFrameworks makes it possible to create almost any kind of generative, data-driven or interactive applications that run on the Raspberry Pi and with the help of the ofxPiMapper it is also possible to projection map them. Projection mapping is the art of texturing real-life objects by using a digital projector and specialised computer software. Krisjanis Rijnieks (http://rijnieks.com) works with creative coding, projection mapping and digital fabrication. He is developing the ofxPiMapper projection mapping addon for the openFrameworks creative coding toolkit, and using it in his own projects. He holds an MA in art and design from the Media Lab Helsinki and is the author of the book Cinder–Begin Creative Coding. The workshop is a part of the Creative Museum project and in collaboration with the Chester Beatty Library. This was written by tdr. Posted on Thursday, December 8, 2016, at 8:41 am. Filed under Workshops/Events. Bookmark the permalink. Follow comments here with the RSS feed. Post a comment or leave a trackback.